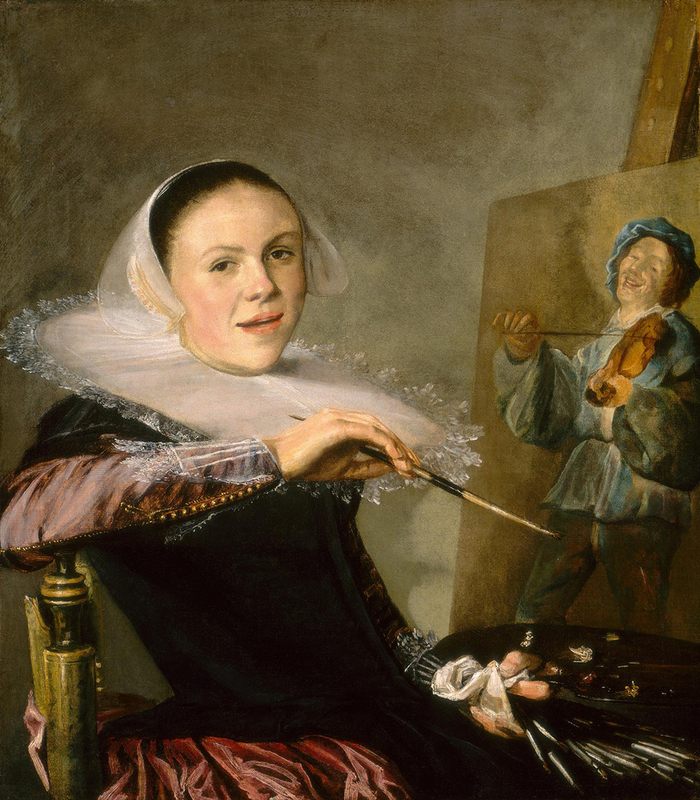 Renowned for her paintings celebrating the happy hour and selfie, Judith Leyster would probably be a fun bestie. Although, she may have been too scary to party with since some of those pictures of drunken revelry involve eels and prostitution (and no, it's not eel prostitution you prudes). Born in Haarlem and stayed Low Country for life. The last name comes from the family brewery. Put her youth in a brewery to good use by making a career out of genre paintings telling the stories of drunks and musicians somewhere between their first round and glazing over into a dribbling blackout. 17th century Haarlem was a great time and place to be a painter. Artists could live in MTV Cribs-style luxury, with people at every social strata trying to get rich or buy art trying. Farmer's barns would be flush with originals we now trek across the globe to see in museums and posh galleries. In a portrait by her husband, Judith is seen plucking a cittern (a small guitar-ish number somewhere between a mandolin and a ukulele) surrounded by such instagram-able accessories as a wall map of Italy, a dog, and half-eaten food. Because nothing's cooler than geography and taking out the trash. She was an independent working artist by age 18 and achieved local fame by age 19 and the first woman admitted to the Saint Luke's Guild in Haarlem, with only one other admitted by the end of the 17th century. Had three students by age 26. She married fellow artist Jan Miense Molenaer later in her 26th year. Judith's career after marriage produced few works, her ribald party portraits basically supplanted by middling still lifes. This shift was likely to avoid competing with Molenaer's artistic output, as they both peddled in ragers. Today, the marriage is blamed for stunting Leyster's still developing artistic style from flourishing into a singular genius (sorry Judith, but #realtalk). Judith was basically forgotten shortly after death. Excepting some pieces including her renowned self-portrait, much of her work was attributed to famed Dutch painter -- and possibly Judith's teacher -- Frans Hals. In 1893, the Louvre discovered its newly acquired The Happy Couple had a fake Frans Hals signature. They should have known something was wrong since there was a handwritten note under the Hals signature that read, "Don't bother looking under here." Underneath the fake signature, like one biker tattoo crudely inked over another, was Judith's initials ligatured by a distinct five pointed star. Legend has it, if a prostitute holds an eel over the star on Judith Leyster signature, a light points you to the nearest dive bar. Go ahead and try it, any decent museum docent will know what you're doing. Judith Jans Leyster (also Leijster) (c. July 28, 1609– February 10, 1660) was a Dutch Golden Age painter. She painted genre works, portraits, and still lifes. Although her work was highly regarded by her contemporaries, Leyster and her work became largely forgotten after her death. Her entire oeuvre was attributed to Frans Hals or to her husband, Jan Miense Molenaer, until 1893 when Hofstede de Groot first attributed seven paintings to her, six of which are signed with her distinctive monogram 'JL*'. Misattribution of her works to Molenaer may have been because after her death many of her paintings were inventoried as "the wife of Molenaer", not as Judith Leyster. Check out the full Wikipedia article about Judith Leyster.